If you are on the lookout for stocks with high dividend yields, look no further than wood pellet maker Enviva Partners (NYSE:EVA), infrastructure owner Brookfield Infrastructure Partners (NYSE:BIP), and real estate investment trust W.P. Carey (NYSE:WPC). Although they all do very different things, each offers a big yield and, just as important, a compelling investment thesis, according to our three Motley Fool contributors. By the time you're done reading about these three high-dividend stocks, you'll likely be ready to add one or more to your portfolio. Brian Stoffel (Enviva Partners): I try to only suggest stocks that I believe in enough to own myself. As I only have one high-yielding stock in my portfolio, this was an easy pick: wood pellet producer Enviva Partners. If that sounds like an odd business, that's because it is. What was once a niche product to keep rural Northeastern homes warm in the winter has completely morphed. Working to meet tighter greenhouse gas emission requirements, power companies from around the world are looking for cleaner ways to produce electricity. Enter Enviva, whose business is relatively straightforward: it owns wood pellet production plants and deep-water ports in the American southeast to vertically integrate its business. It ships the pellets it produces to European and -- increasingly -- Asian power companies on the basis of decades-long contracts. The more efficient Enviva's operations become, the more that's left over to pay shareholders. Those efficiencies have been hamstrung by a fire at one port, but the most recent earnings report was largely positive, and management still expects to pay out $2.53 per share for the year -- equal to an 8.9% yield at today's prices. Keith Speights (Brookfield Infrastructure Partners): You don't have to be a retiree to salivate over Brookfield Infrastructure Partners' dividend yield of just a shade under 5%. And even youngsters years away from retirement can appreciate Brookfield Infrastructure's dividend hikes totaling 47% over the last five years. But there are even more things to like about this stock than its terrific dividend. Brookfield Infrastructure Partners owns and operates infrastructure assets across the world. These operations include communications towers, natural gas pipelines, ports, railroads, toll roads, and more. The nice thing about these businesses is that they provide steady revenue for Brookfield Infrastructure. That leads us back to the dividend, by the way, since this steady revenue allows the company to keep those nice dividend checks flowing. But don't look at Brookfield Infrastructure simply as a boring income play. The company has trounced the overall market over the last five years, delivering a total return during the period of more than 100%. The future looks bright for Brookfield Infrastructure as well. Management noted in the company's Q3 conference call that new acquisitions should jump-start growth and that there's plenty of financial flexibility for more strategic deals down the road. A great yield and great prospects make this stock a great pick for retirees. Reuben Gregg Brewer (W.P. Carey): W.P. 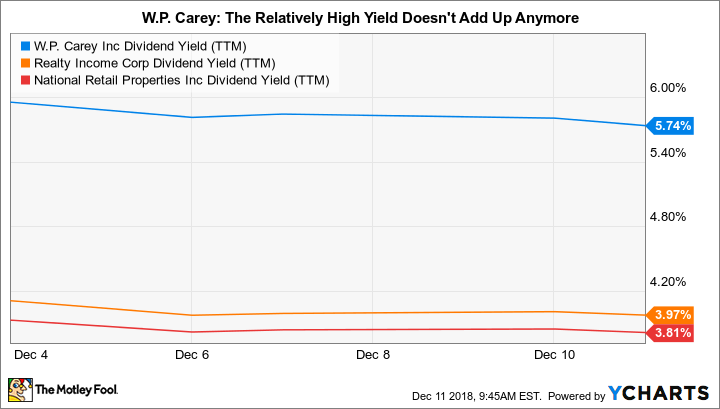 Carey's yield is currently around 5.9%, materially higher than the 4% yield of triple-net-lease peer Realty Income. Although Realty Income is considered the industry bellwether, that yield difference is looking increasingly out of touch with W.P. Carey's long-term story. Triple-net-lease real estate investment trusts, or REITs, generally buy properties from their owners and then instantly lease them back. The owner gets cash and continues to use the property like it always had. REITs like Carey get to earn the spread between the rental rate and its financing costs. But the kicker is that the lessee takes care of most of the costs of the property, like maintenance and taxes. It's a pretty conservative business model. But for many years, Carey had an asset-management unit that created and managed nontraded REITs, a much more volatile business. It recently shuttered that division, with the purchase of a major nontraded REIT it still managed reducing the remnants of that operation to just a few percentage points of revenue. Essentially, Carey is just a boring old triple-net-lease REIT today. However, it still does things just a little differently, which spooks some investors for no good reason. Realty Income and many of Carey's other peers are focused heavily on U.S. retail properties. Carey prefers to take a more diversified approach, spreading across industrial (28% of rents), office (23%), warehouse (24%), and retail (13%). It also gets about a third of rents from non-U.S. properties, increasing diversification even further. Far from a negative, this unique diversification gives management more opportunity to invest and grow -- which the REIT's done very consistently, rewarding investors with 21 consecutive years of annual dividend increases. If you can think a little outside the REIT box, W.P. Carey, with its robust yield, is worth a deep dive now that it's a pure-play REIT.